In Alopecia Awareness Week 2016, we began our #EmbraceAlopecia campaign and theme for the year. We’re very proud of the response we’ve had to the campaign to Embrace Alopecia, especially the individuals in our community who came forward to share their stories and personal journeys, many of which can be found here on Love, Alopecia. 12 months later and we want to continue to build on the outstanding success of #EmbraceAlopecia and maintain our dedication to championing awareness and understanding of alopecia, promoting acceptance of appearance diversity and providing support to help individuals find self-confidence and happiness on their journey with this condition. To help us on this path, our theme for 2018 will be Healthy Alopecia. 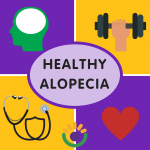 The Healthy Alopecia theme will structure much of the programs, events and communications executed by AAAF and is to be all inclusive audience program. This campaign will focus on a broad range of health and wellbeing areas, including positive mindsets and mental health, physical excise, empowerment, diet and nutrition, healthy social connectedness and skills to support these areas. We have a massive event calendar lined up, with a huge range of events and activities in the works for all our state branches. If you’re not already registered with AAAF, now is the time to sign up for email updates when we have something happening in your area. Registering is completely free and only takes a few moments.